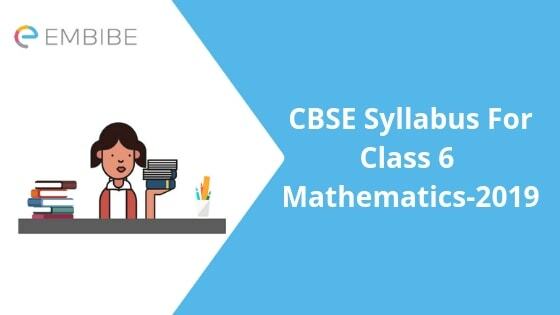 CBSE Syllabus For Class 6 Mathematics 2019 | Central Board of Secondary Education (CBSE) follows one syllabus nationwide for its subjects. The National Council of Educational Research and Training (NCERT) is the approving authority for the CBSE syllabus. We are including the detailed breakdown of CBSE Syllabus For Class 6 mathematics for the reference of the students. The syllabus is designed to make the base of the students strong for their future studies. The syllabus is designed by experts with the consideration of each and every basic mathematical concept. The subject will include concepts like Numbers, Geometrical Ideas, Decimals, Data handling etc. The CBSE Syllabus For Class 6 Mathematics introduce its students with the basic concepts of Mathematics. The syllabus begins from the section called Knowing Our Numbers and ends with the section called Symmetry. The First section introduces the students with various complex series of numbers like thousands to trillions etc. To understand further, please read the detailed explanation for each section given below. Knowing Our Numbers- This section is designed to make students aware of various complex values of the number. The section includes numbers like Millions, billions, etc. Students also learn to variate numbers, compare them etc. Apart from that, the chapter includes the study of complex numbers, estimate sum, the difference between the numbers etc. The section introduces the students with numbers like 1,00,000 etc. Whole Numbers- As the name reflects, the chapter includes the study of whole numbers, their concepts, and features. It talks about the properties of the whole numbers, the patterns in a series of the whole numbers etc. The chapter also introduces the students with topics like number line and working on the number line. Concepts like the predecessor, successor are also an important part of the chapter. Playing with numbers- The chapter talks about the concepts like Factors and multiples, prime and composite numbers, factors and common multiples, prime factorization, HCF and LCM etc. The chapter also introduces the students with other important concepts like divisibility of numbers, prime factorization etc. Basic Geometrical ideas- The section is designed to make students aware of basic geometry. It talks about the sections like parallel lines, Ray, curves, polygons, angles, triangles, circles etc. The purpose of this subject is to make sure that students get the basic idea about future geometrical problems. It will help them in building a strong foundation for themselves to the respective of the Geometry subject. Understanding Elementary Shapes– This section of the study introduces the students to various designs and shapes included in the maths. The section provides the basic knowledge of the shapes and designs which can be useful for the tougher syllabuses in the advanced classes. Some important topics which are included under the chapter are Line Segments, Right and straight angles, Acute, Obtuse and Reflex angles, Perpendicular angles, Polygons etc. Integers- This is a section which includes the fun learning. The chapter includes the points like Tag me with a sign, Integers, Ordering of integers, Addition of integers etc. Fractions- The 7th chapter of the subject includes the topics like Fraction on Number line, Proper fractions, equivalent fractions, like fractions, comparing like or unlike fractions, adding or subtracting like fractions etc. Decimals- This portion of the study first introduces and talks about the value of decimal in numbers. Later the level increases up to the uses of decimals in tenths, hundredths etc. Another part of the chapter makes sure that you learn about the application of the decimals in real-life applications like Money and weight etc. Data Handling- The chapter includes various activities related to the graph data. It introduces the students for the concepts of recording, drawing, and the organization of the graphical data. The students learn about calculating the values with the help of the data into the pictograph form. Mensuration- This part of the study includes calculating various designs and figures with the help of their area and volume. The purpose of the chapter is to make students aware of the tools which can be helpful for them into various kind of measurement activities for the shapes and the designs. Under this chapter, the students learn about the topics like perimeter, measurement of the perimeter, area, area of a rectangle etc. Algebra- This is the beginning portion of the Algebra chapter for the students. The syllabus is designed to introduce you with the algebra, its uses in the mathematical problems etc. You will get to know about various matchstick problems, various uses of variables in the common, expressions, expressions with variables and using expressions practically. Some portions of Algebra will be based on an equation and its solution. Ratio and Proportion- This chapter will be based on the introduction of the ratio concepts and the uses. Ratio and Proportion will be defined separately and then students will learn about the relations between them. The conclusion of the chapter will have the examples for ratio and proportion both concept and the study of the unitary method. Symmetry- The chapter will be based on the symmetries and its applications in real life. The chapter will begin with the basic introduction and then the discussion will be about Ink Blot Devils. Later, the study of figures with multiple lines of symmetry, reflection and symmetry etc. The purpose of this chapter is to make students familiar with the concepts of the Symmetry so that the future syllabus related to the symmetry concept can be familiar. As you know that the CBSE Syllabus for Class 6 mathematics is a combination of 13 various chapters, each chapter has its own practice portion. It is advised for you to go through the previous year question papers and solve the equations. The practice will be helpful for you in memorizing various concepts and improve the problem-solving speed. We hope that our article on CBSE Syllabus For Class 6 Mathematics was useful for you. If you have any query or feedback to share with us, please feel free to drop a comment below. We will get back to you within a very short time. Meanwhile, we are winding up this article with the best wishes for you on behalf of the whole team of Embibe.